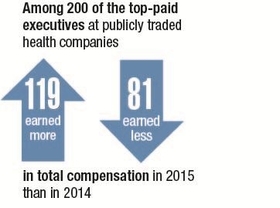 Many of the highest-paid healthcare executives saw their compensation hammered in 2015 as economic headwinds broadly dampened executive pay at publicly traded companies. But more of them appear to have bucked the trend. But median pay increased 8% to $6.9 million among 200 of the highest-paid healthcare executives who held the same position in 2014 and 2015, according to a Modern Healthcare review of total compensation reported in 2016 proxy statements. Compensation went up for 119 of the executives in the sample and declined for the other 81. Total compensation for senior executives at hospital companies, including salaries, bonuses and stock awards, fell by 17% from 2014 levels. For example, Community Health Systems' CEO Wayne Smith saw his compensation in 2015 plummet 22% to $9.3 million from $11.8 million in 2014, largely as a result of his annual performance-based bonus falling to $400,000 from $4.1 million in 2014. The vast majority of senior executive pay in healthcare is pegged to bonuses and stock awards for meeting financial targets, such as adjusted earnings and total shareholder value, rather than base salary. Consequently, there's a strong correlation between executive compensation and how a company and its stock perform in any given year, said Brian Tanquilut, senior vice president of healthcare equity research for Jefferies & Co.
Hospital stocks as a whole have been struggling since midsummer, when investors started dumping them because of wage inflation—a bad sign for hospital costs—and a topping out of volume increases from the Affordable Care Act, Tanquilut said. That was followed in the second half by earnings declines at CHS, Tenet Healthcare Corp. and even some of the big physician staffing companies. Many stocks also were hit by a general investor flight from companies that are highly leveraged, which is common among the big hospital operators. CHS and Tenet, the nation's second- and third-largest investor-owned hospital companies, respectively, carry debt six times annual EBITDA from acquisition activity. Five years ago, a ratio of 3.5 to 4 times would have seemed high, Tanquilut said. Those factors caused CHS' stock price to plunge in 2015 from a June 26 high of $64.04 to finish the year at $26.53. Tenet didn't fare much better. Its stock peaked at $60.78 in July before falling by half to $30.30 to end the year. Executives for those companies are now feeling that struggle in their own paychecks and portfolios. In a candid letter to CHS shareholders atop the company's 2016 proxy filing, Smith took responsibility for the disappointing performance. “Our results for 2015 did not meet many of the (financial) targets set forth in the employee performance incentive plan, which resulted in meaningfully lower performance bonuses paid to our executives for 2015 and no increase in base salary for our CEO and CFO (W. Larry Cash) for 2016,” Smith wrote. Smith also is looking at a big reduction in the value of restricted stock awards this year. The proxy shows his performance-based restricted stock grant in 2016 will fall 68%, from $7.3 million in 2015 to $2.3 million this year. That goes along with a freeze in base salary this year at $1.6 million. Tenet CEO Trevor Fetter, likewise, received less compensation in 2015. His total compensation fell 14% to $15.4 million last year from $18 million in 2014. Healthcare investors used medical-device company stocks as a haven from the troubles roiling the provider space. 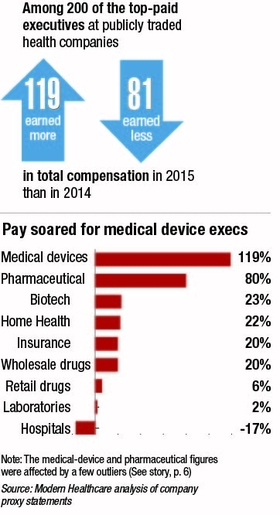 Compensation for the devicemaker executives in Modern Healthcare's sample shot up 119%—although that figure is somewhat distorted by huge gains under special circumstances at Medtronic and Masimo, which makes patient-monitoring technology. Health insurance executives in Modern Healthcare's sample saw compensation rise by 20% in aggregate. The year was marked by big mergers and some sizeable increases in pay for the CEOs involved. Aetna, which announced plans for the $37 billion purchase of Humana in July, boosted total compensation for CEO Mark Bertolini to $17.3 million in 2015.